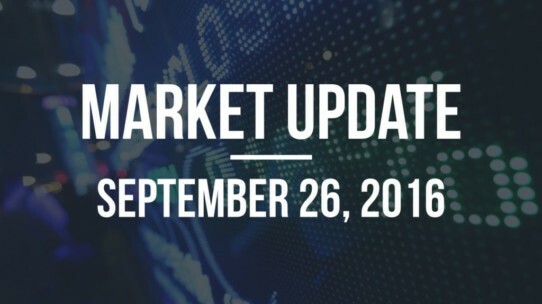 The markets have finished up over the past week with the S&P 500 up 1.21%, the Dow Jones up 0.8%, international stocks (EAFE) up 2.54% and US Aggregate Bonds up 0.47%. Top asset classes for the past week include Japan (4.2%), Greece (4.15%), and Australia (3.37%). Bottom asset classes for the past week include British Pound (-0.57%), US Dollar (-0.36%), and Floating Rate Note (-0.06%). Top asset classes for the past month include Silver (5.42%), Hong Kong (5.16%), and Biotech (4.57%). Bottom asset classes for the past month include Oil (-6.94%), Mexico (-6.21%), and Materials (-2.41%). The ESI’s current value of 32% (down from 45%) indicates that the US economy is no longer in prime territory to support growth. While job numbers remain very strong and unemployment remains low several aspects of the US economy have begun to show their age in this market. The ESI’s move to the low 30’s is a vote of caution. The economy is becoming more vulnerable to shocks. Should the ESI continue to maintain its low value or decline further, the likelihood of a recession will increase. The levels of several indicators are still in fair territory (with a couple indicators in optimistic territory, mostly job numbers), while others are far below average. Year over year growth rates amongst the indicators underlying the ESI are in the 19th percentile (0 to 100 scale) down from the 21st percentile last month. This, combined with the current value of the ESI imply that we may see more softening of economic numbers to come. Last week equity markets were down going into the Fed’s interest rate policy meeting before rallying on the news that interest rates would remain the same. US markets were mostly up this past week, with the Utilities and Real Estate sectors rallying the most with 2.39% and 3.25% returns respectively. 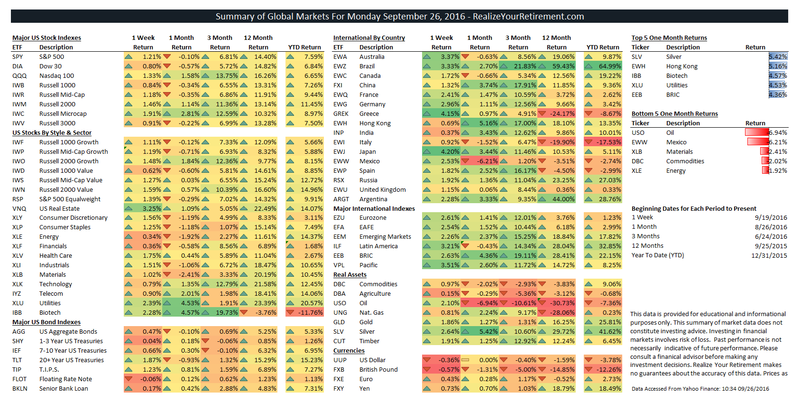 International stocks also rallied over the past week as well. Of international markets, Japan (4.20%), Greece (4.15%), and Germany (2.96%) rallied the most. Bond classes rallied over the past week due to the interest rate targets of the Federal Reserve remaining unchanged for September. Out of the core bond asset classes, 20+ Year Treasuries (1.87%), T.I.P.S. (1.23%), and 7-10 Year Treasuries (0.66%) had the highest returns. Due to current US economic metrics, markets had not expected the Fed to raise interest rates this quarter. However, markets have been pricing in a higher possibility for the Fed to raise interest rates during their next policy meeting in December and recent comments indicate that an interest rate hike then is still on the table. I’ll continue this refrain as long as we’re at the top of the markets. It’s easy to become over-allocated to stocks when markets are making new highs and the volatility of the last year is seemingly in the rear-view mirror. However, in times like these (when markets are near their highs or reaching new ones) risk is at its greatest, so it’s important to maintain a balanced outlook in your portfolio. When volatility increases, as it has in the past few weeks, it’s best to make small changes to your portfolio, with each change moving your portfolio to a more comfortable allocation or to adopt a strategy that does so automatically. Large changes often lead to regret and poor market timing.